Evan McAleer submitted this photo and caption. This picture was taken one night in November when nine of us LSU students who have marched got together for an awesome night of watching hours of classic drum corps shows. 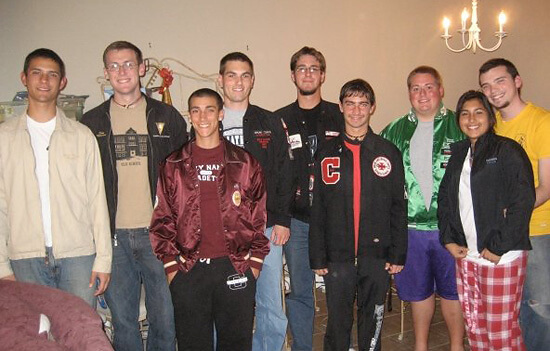 From left to right: Aaron Theall (Carolina Crown '08), Evan McAleer (Glassmen '08, '09), Nic Broussard (Cadets '08, '09), Kyle Nijoka (Phantom Regiment '07, '08, '09), Michael Roy (Phantom Regiment '06, '08), Josh Sears (Crossmen '07, '08, '09), Mitch Swenson (Pioneer '07, '08), Erica Simon (Bluecoats '09), and Ryan Foley (Bluecoats '08 ... even though he forgot his jacket).